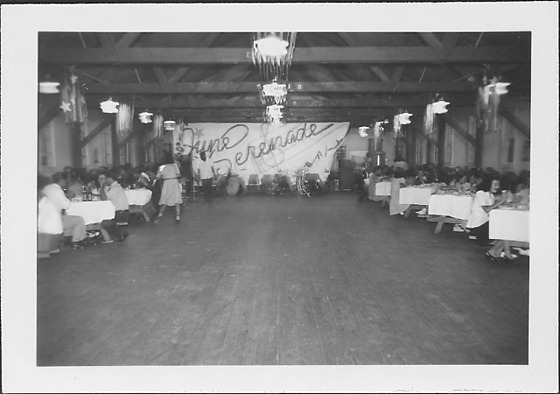 June Serenade gathering with several dozen people seated and eating at cloth-covered tables set at an angle against walls on either side of what is probably a mess hall at Rohwer concentration camp, Rohwer, Arkansas, June 2, 1945. Across expanse of space in center hangs a white backdrop, "June Serenade" behind a group of empty chairs and music stands. A man and a woman stand at center left. Light fixtures overhead are draped with streamers and stars. Written in pencil on back, C: Jun 2 1945.